Anihan graduate is a sous chef of The Black Pig Charcuterrie, Bar and Restaurant. 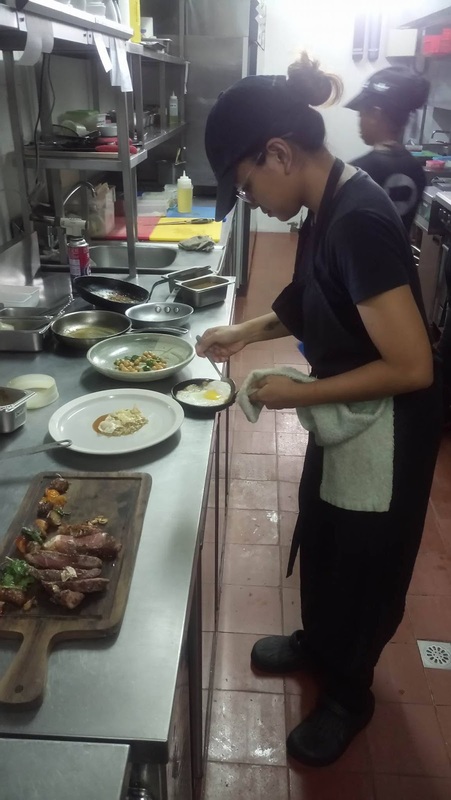 Anihan Technical School graduate, Fariza or Far, did her on-the-job-training partly at Las Flores at the Fort, and partly at The Black Pig in Alabang. After Far graduated in 2014, The Black Pig hired her. The restaurant’s Spanish chef was impressed with her work because of her consistency and sense of order in the workplace. Now, Far, together with another Anihan graduate, is a sous chef at The Black Pig. Aside from her main responsibilities as a sous chef in this position, Far's opinion and feedback regarding trainees’ performance are taken into consideration by the management and owners. Far was the first Anihan graduate to work at The Black Pig, and now, the restaurant continues to employ more Anihan graduates because of their good working skills and values. Far is from Los Baños, Laguna and comes from a family of three children. With her position, Far is able to help shoulder their family and household expenses.